President Donald Trump's still-evolving foreign policy doctrine is the subject of contentious debate within the foreign policy establishment. The disagreement stems from such things as the administration's unconventional approach to dealing with U.S. allies (including Germany, Canada, and NATO more broadly), as well as with less friendly actors in Russia, North Korea and Syria. 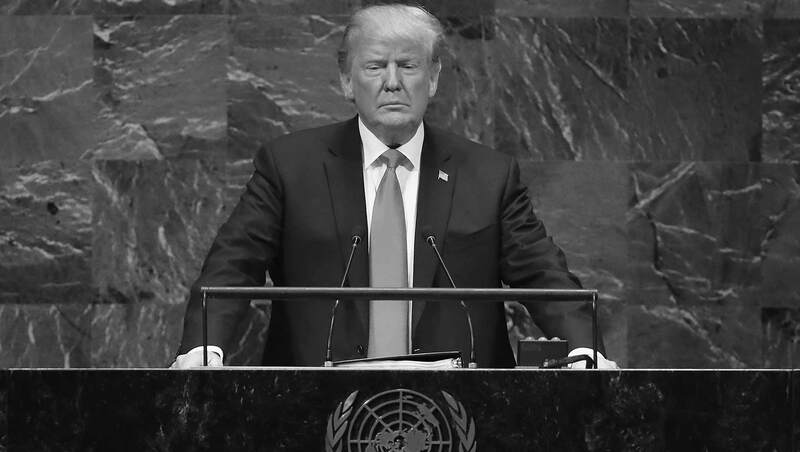 Seventy-five years after the end of World War II, the U.S. seems caught between its postwar role as leader of the international order and Trump's belief that it is time for the United States to question some heretofore fundamental assumptions in dealing with the world and to scale back some international commitments. At the same time, in a recent press conference, the president seemed to contradict this when he replied to a question about whether the U.S. could get involved militarily to replace the current Venezuelan dictator, saying sternly, "We're not considering anything, but all options are on the table." Both before and during his presidency, Trump has questioned whether some of the old underpinnings of U.S. foreign policy still hold true. He has repeatedly made statements indicating that he objected to the Iraq War and wants to pull U.S. troops out of Syria, but at the same time has greatly increased the U.S. military defense budget while in office. The table below shows how each of the five foreign-policy-vision groups evaluate Trump's foreign policy after his second full year in office, along with how they feel about the U.S. position in the world today. Foreign policy "Hawks" and "Populists" -- the two groups that think the U.S. is spending too little on the military -- widely approve of Trump's performance on foreign affairs. This is the case even though Hawks think the U.S. should be playing a major or the leading role on the world stage, while Populists favor a minor or no U.S. role. However, the Populists are more dissatisfied with the United States' position in the world today -- perhaps because they see too much U.S. involvement. "Status Quo Moderates" are more negative than positive toward Trump, 59% disapproving vs. 39% approving. This group, whose support for a strong U.S. global role and for keeping defense spending at its current level aligns with the internationalist-oriented foreign policy establishment, is evenly split on how they view the U.S. position in the world today. Meanwhile, the foreign policy "Liberals" and "Doves" -- both of which think the U.S. spends too much on the military -- are mostly disapproving of Trump's foreign policy and feel dissatisfied with the nation's position in the world today. One of the most controversial debates about the Trump presidency has been his threat to pull out of the NATO alliance based on his belief that many of the NATO countries are not paying their fair share to maintain European defenses. This "art-of-the-deal" posturing by Trump does not seem to have persuaded any of the five strategic vision groups that represent the U.S. foreign policy debate structure in the U.S. Majorities of all five groups believe the alliance should be maintained -- a rare example of foreign policy bipartisanship and a remarkable shared vision of U.S. support for NATO. "Now thinking about NATO, the military alliance among Western nations, do you think the NATO alliance should be maintained, or is the alliance not necessary anymore?" Americans' evaluations of the effectiveness of the United Nations as one of the two great institutional pillars of U.S. foreign policy since World War II reveal a different picture. Only the foreign policy Liberals are mostly supportive of the U.N., with 61% saying it's doing a "good job." By contrast, the Hawks and Populists are strongly inclined to say the United Nations is doing a poor job, and the Doves lean that way too. Status Quo Moderates are more evenly split. Overall, Americans as a whole tilt negative in their views of the U.N. today (with 44% saying it's doing a good job vs. 53% a poor job). However, that doesn't mean they want the organization disbanded; the same Gallup poll finds a clear majority of Americans, 66%, saying the organization plays "a necessary role in the world today." "Now thinking about the United Nations, do you think the United Nations is doing a good job or a poor job in trying to solve the problems it has had to face?" The Trump administration has shifted to a somewhat more security-based protectionism of U.S. interests rather than a perpetuation of the present world order. But as Trump continues to develop his approach to world affairs, Americans' ratings of his handling of foreign policy are more closely tied to their views of defense spending than their preferred global role for the U.S. As such, he is rated most positively on foreign policy by Hawks and Populists, and least positively by Liberals and Doves. Trump has more leeway with his base groups when it comes to how involved the U.S. should be in solving international problems, as some of those who approve of him want the U.S. to maintain a large role and others a minimal role. However, all five groups agree that the NATO alliance should be maintained -- suggesting that were Trump to follow through on threats to pull out of the defense pact, it could create a public backlash.